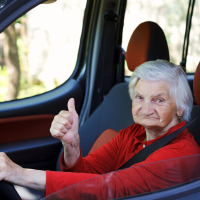 More than 200 centenarians are legally able to drive on UK roads at a time when the number of people living beyond 100 has reached record levels, official statistics have revealed. The Driver and Vehicle Licensing Agency (DVLA) said 248 people aged more than 100 years old still hold valid driving licences. At the same time, the number of people aged 100 or over in the UK has reached record levels, according to the Office for National Statistics. How safe are older drivers? Under current rules, drivers who are over 70 have to renew their driving licence every three years. The issue of how safe elderly motorists are on our roads is often discussed, with campaigners highlighting the impact of sight problems and cognitive decline. Last year, Swansea University investigated whether there was any link between elderly drivers and accidents. Researchers found older drivers are around four times less likely to be involved in an accident than males aged 17 to 21. Currently there are 14,570 centenarians living in the UK. Over the past decade, numbers have risen by two-thirds. Anyone celebrating their 100th birthday with a holiday abroad can arrange specialist seniors travel insurance for their trip.